L.A.: Colby Poster Printing Co, 1976. Very Good. Large boxing-style poster printed in blue on thin cardstock. Approximately 22" x 28". Some slight edgewear and smudging, a nice, very good or a little better example of what must be a very uncommon survivor. The thin cardstock wouldn't have lent itself well to preservation. 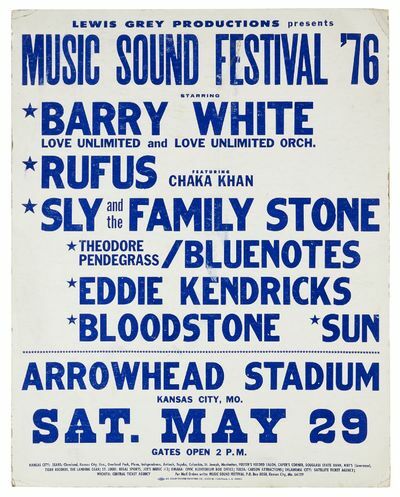 A nice lineup of important soul and funk artists at a pivotal moment when music by black artists was in a tectonically transitional stage.